9 Jul 2016, Saturday. I woke up with excitement this morning. If all things go well, the Bajaj Pulsar 200NS should be fixed by today and ready to roll! It’s been 8 days since it went into the workshop for a top engine rebuild. 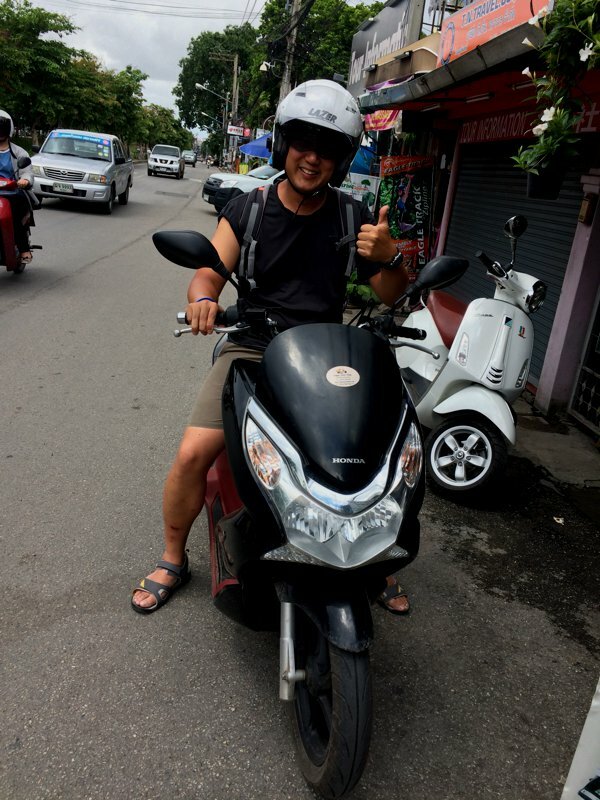 And so I packed my stuff, left Chiang Rai, and headed back to Chiang Mai on the rented Honda PCX 150. 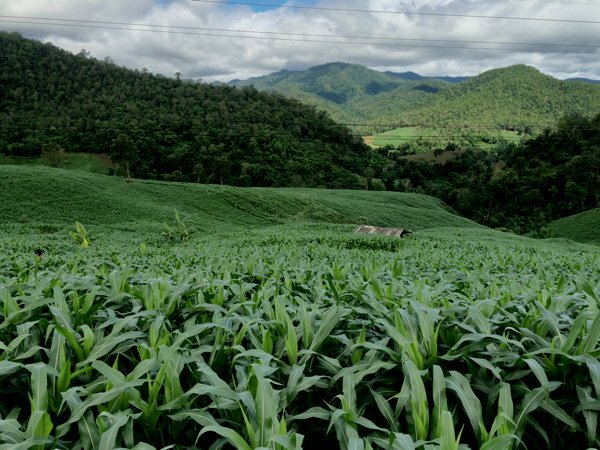 The route between Chiang Rai and Chiang Mai runs through some amazing greenery and vast crop fields – something I didn’t get to enjoy when I rode up here due to the super heavy rain. 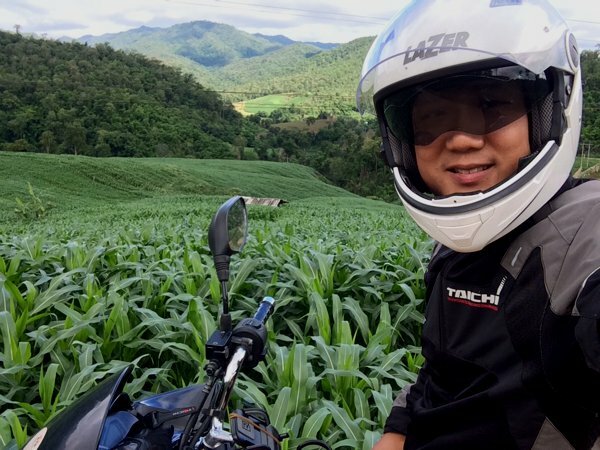 With an amazingly nice weather, I took my time and rode at a leisurely pace of between 60-80kmh as I made my way back towards Chiang Mai. Oh, by the way, the PCX maxes out at around 100kmh indicated. 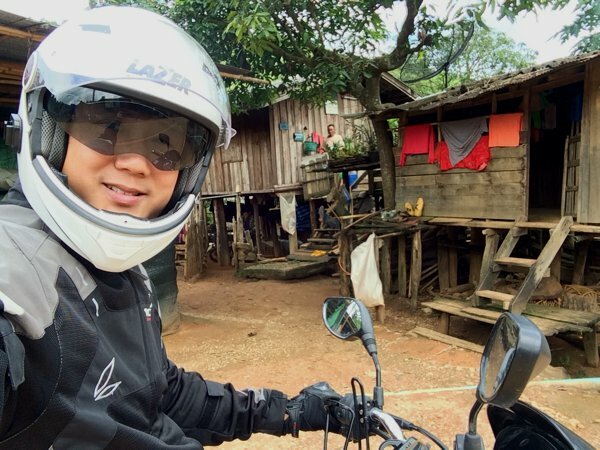 Although the silky smooth Honda 150cc engine was pure pleasure when scooting around town, it doesn’t do too well on longer distance touring. I miss my Pulsar. But I thought I had better get used to these low’ish speeds as I’d have to run-in the rebuilt Pulsar engine – keeping speeds below 80-100kmh for the first 2,000km or so. 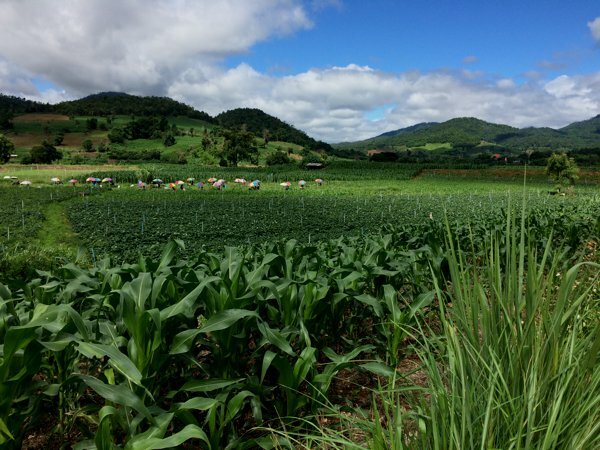 Some crop fields between Chiang Rai and Chiang Mai. Those colourful dots are farmers doing their thing while holding umbrellas shielding them from the merciless sun rays. And somewhere along the way, I saw a sign pointing towards a local village along with the words “Tourist Attraction”. Well, I’m a tourist, and I got attracted. So I turned in. 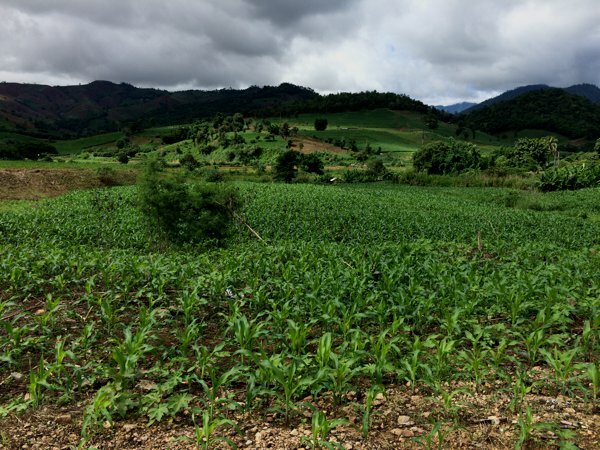 And yet more fields along the rural road on the way in to Suan Lahu Village. 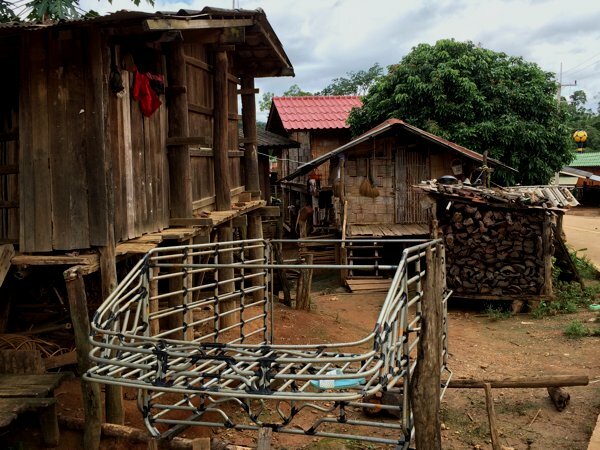 Some amazing views on the way to Suan Lahu Village. I spotted a girl’s head popping out of the crowded field of crop and took this pic. Can you spot her here? Me, the PCX, and some amazing views. 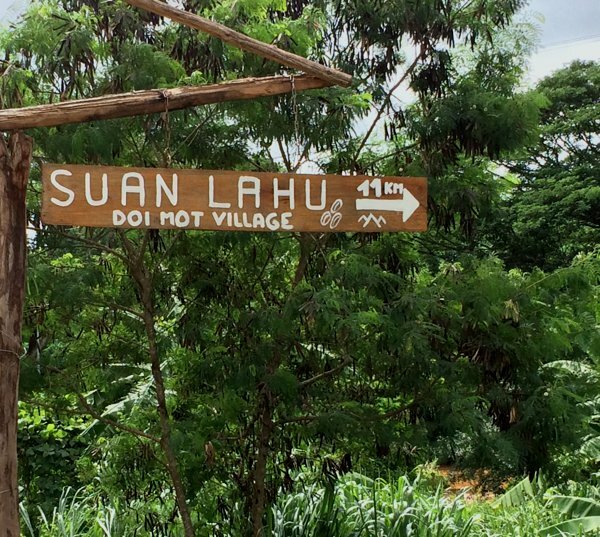 The Suan Lahu Village in Doi Mot is a local remote village off the beaten track. 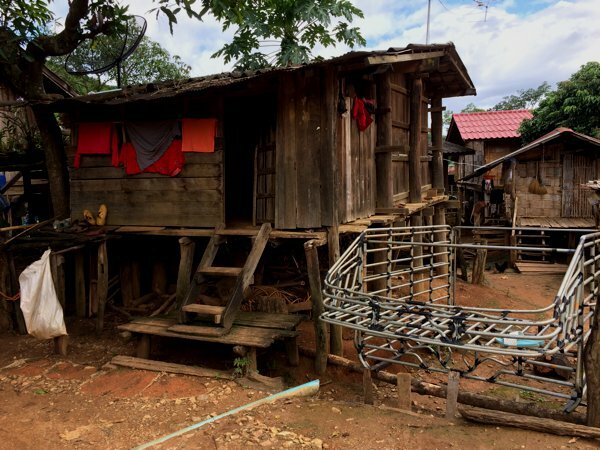 A local tribe lives here, and they appear unaffected by modern day decencies. Yes, you can see children running around naked, and I spotted an older lady bathing somewhat in the open. Sorry, no pics. The guy in the background was staring at me with unapproving eyes. I took this shot and quickly left. Just one last shot before I left Suan Lahu. Before long, I reached Chiang Mai. Honestly, I find the Chiang Rai – Chiang Mai route rather refreshing. 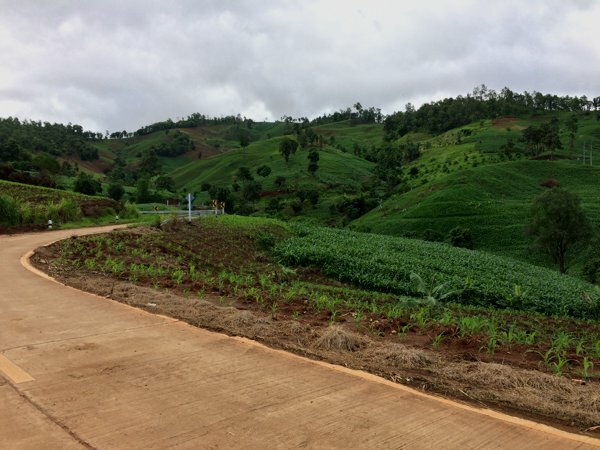 There’s enough scenery and twisties to keep me happy, but a lot less strenuous then the Mae Hong Son loop. Perhaps also partly because I was on a 150cc automatic scooter – twist and go with no need for clutch play. But the 150cc scoot is a tad bit underpowered though. Before I could pick up my Pulsar, I had to return the PCX. Well, at least we had some good times in Chiang Rai together. The nice lady who let me extend my rental by a couple of hours at no charge, while waiting for my Pulsar 200NS to be ready for collection. I was so happy to be reunited with the Pulsar 200NS that I forgot to take any pictures. With new valves, new valve springs, a new piston, a new cylinder, a new camshaft, new rocker arms, a new timing chain, and many other new parts, it’s almost like a new engine. And it certainly feels like one! The first couple of minutes on the new engine was pure, pure pleasure – the Pulsar 200NS engine has NEVER felt so smooth! Perhaps I got a dud when I bought the bike (I am the second owner), but the soft, smooth purr of this newly rebuilt engine was pleasantly unfamiliar to me. For the next 500km or so, I’ve to let the piston rings sit properly and I’m limiting my rpm’s to below 5,000 or so. Ah! Finally! Now I can journey on! sgBikerBoy is happy once again.